Sorry I guess I wasn't clear what I'm talking about. I wanted to just have 3 rbd objects bumping into one another. My thinking was that I could animate the objects and then have pin constraints created based on that animation. Each of the 3 objects would then be attached to their relative constraints. The DOP network would have an RBD object for each piece of furniture that is doing it's best to follow the motion. does that make sense? Genius Houdini Community! I'm having a hard time wrapping my head around something so I thought it best to ask the experts out there. We're about to do a project where a rigid object ( like a box or a tea kettle ) is floating weightlessly in a room. It is being blown around by wind and bumping into objects as it goes. What we would like to do is loosely keyframe the object for basic choreography and timing but have the dynamic object "follow" it, like a target. This way you get the benefit of having keyframed motion influencing the dynamics. Would a sop solver be the right way to go here? Field force? It's been a while since I used dops so any advice or examples would be appreciated. I'm sure there's an elegant solution out there but I'm just not able to think of it. Thanks very much! In an attempt to simulate the way bubbles in a head of foam grow and push each other around, I'm trying to use the ODE solver. The problem is a lack of any kind of scale control on each individual sphere primitive. Toggling on "Use Deforming Geometry" seems to do nothing to the influencing radius as the simulation runs. The goal is to have lots of little spheres pushing against one another, but with some of them getting bigger and pushing the others out of the way as the simulation grows. I can't figure out how to do this, unfortunately. Advice, or better yet, example hip files are welcome! Thanks in advance Odforce community. HI there, Sometimes I find myself doing projects with lots and lots of prebaked geometry data that is a hassle to go back and recook. In these cases I really wish I could tell my surface shader to look up some coordinates from a projection camera ( OTHER than my rendering camera ) that I've set up without having to go back and bake in UV coordinates on the points or vertices. I see that you can do something in Light_NDC space, which is cool. 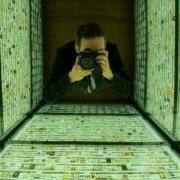 I would like to do the same transform in a camera_NDC space. not sure. what am I looking at? Super cool. thanks for this! It was well timed since I've just now started poking around into manipulating density fields in vops. I've had some luck trying to manipulate the values with expressions using the volumemix sop, but I can see that this is a much faster way to go. The particular problem I'm working on has to do with carrying uv coordinates through the volume system all the way to the renderer. Essentially I'm trying to get "P" out of my noise generating at the shader level by replacing it with something that deforms with the geometry. Imagine an animated guy walking across the scene. I'm trying to fill him with puffy cloud stuff without having the noise pass through him. I want the noise to move with his body, as if he he's made of big shaggy carpet stuff. I started experimenting with creating a "uvw" volume, and it's been really good! The tricky bit is stuffing coordinate values into a volume that doesn't really know that the stuff around it is moving. Currently I'm stuffing a block of points with uv values that relate to the geometry nearest to it, then source those uvw values from a volumemix node using nearpoint() followed by a point() expression. I then including these four volumes at render time: o: density 1: uv.x 2: uv.y 3: uv.z this does a nice job of "gluing" the coordinates the shader uses to the volume at render time. I would really like to use the volumevop to do this but I'm not sure how to use the pointcloud stuff yet. Those vop nodes don't have help cards, unfortunately ( RFE! ). The double sided glass really solved the IOR questions. Thank you. The bigger issue is the type of lighting I get on the internal glass pieces when surrounded by a large, clear glass surface. I've included 2 images to help demonstrate the issue. The image "open.jpg" shows a bunch of red, glassy objects inside of an opaque half dome. The scene is lit with an HDR, giving the glass cubes lots of shiny, reflective lighting. All good there. The second image, "closed.jpg", has that same set of cubes surrounded by a clear glass outer structure. You can see that the cubes are getting some light, but not nearly the characteristic that they have in the open one. My Reflect_Limit is set to 14, so I'm getting all the bouncing I feel that I need. You can see that the HDR is not reflecting onto the cubes in the same way, only reflecting the diffuse component around between the cubes. I'm trying to figure out how to get the cubes to look like they do in the open.jpg image, but with clear glass around it. Great advice. Thank you. I'll try this next.